John has been attending the Nazlini Senior Center for nearly 15 years. John may have a few regrets, but he has led a varied life. At 74, John has been attending the Nazlini Senior Center since he was 60; the meatloaf is his favorite. Nazlini means Bend in the Water Flow and this small community is located in the middle of the Navajo Nation south of Canyon de Chelly in Arizona. 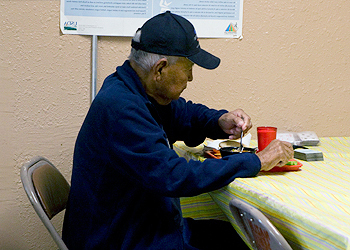 The Nazlini Senior Center is one of hundreds of Program Partners served in the Southwest and provides meals, activities, socialization and resources to the community’s Elders. Born and raised in Nazlini, John lives just 2 miles “up the road,” but has traveled outside of this small community of 400+ residents on many occasions. He held many other positions over the years: a Park Ranger for two years and four years at the Cooper Mine, where he recalled seeing cockroaches the size of his thumbs. 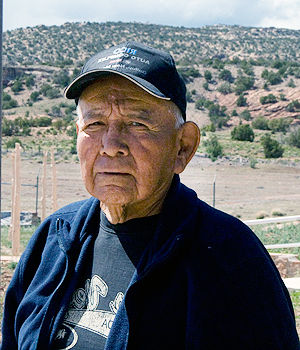 In Gallup, New Mexico, he worked for a uranium company for ten years, before they closed down. John spent another six months in Phoenix, where he polished slots machines and even raised livestock. There were about sixty cattle and he recollected that this was hard work, especially in the winter. The meatloaf is John's favorite meal at the center. Even though he had held several long-term jobs, John missed his pension by a mere six months. Social Security has had to suffice. After nearly fifteen years attending the center, John was especially appreciative of all the work that went into the warm welcome of the Elders, as well as the nourishment of both food and friends. John may have regretted missing a great concert years ago, but he certainly was thankful for a life full of memories.